So what is mao cha? Mao cha is a simple county-style manufacture of leaf materials that consists of simply pan-firing the fresh leaf, rolling the leaf and allowing it to dry slowly in the sun. Mao cha is drunk by villagers in Yunnan ( it is essentially young sheng Pu-erh) and it is the base tea for all forms of Pu-erh. Mao cha is simple to manufacture but is complex in its diversity. Mao cha can be made from the fresh leaf of one tea garden or be a blend of leaf from an entire tea village or from several tea producing villages within one county. As you can see, the possibilities and resulting flavors of mao cha are almost endless. All of these variables result in a staggering choice of available mao cha from all of the producing regions for Pu-erh producers to work with. The mao cha recipe for this Pu-erh rectangle # 7572 – is a Menghai classic and a taste standard in the world of shou Pu-erh. This recipe is made every year by many Menghai tea factories from various lots of mao cha, so the taste will vary even if the recipe does not. Seven grades of mao cha gathered from the Menghai area are mixed in this blend, plus a good sprinkling of golden tip spread on the surface of the cake give complexity and fullness to the flavor. 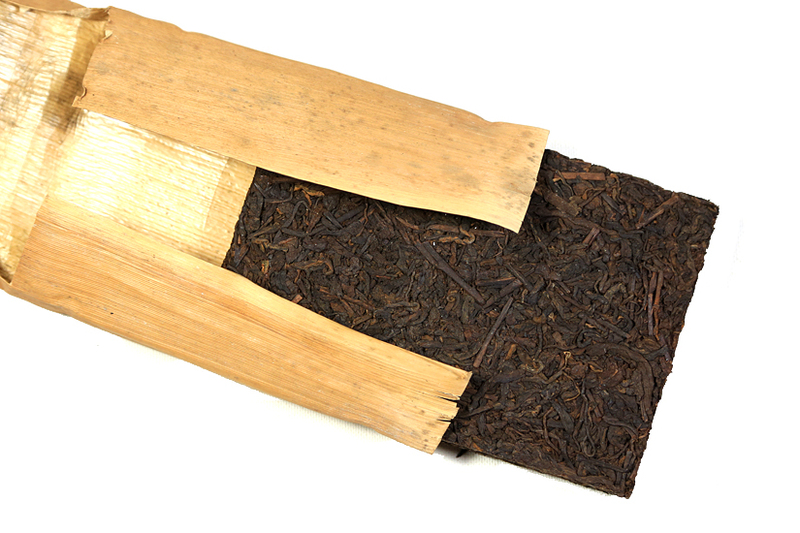 Medium fermentation gives this Pu-erh a mellow, harmonious taste and a long pleasant sweetness. Drink this tea now or age the brick further to encourage softness and smoothness in the taste. Each rectangle is individually wrapped in bamboo leaf, not paper, and stamped in red ink with the recipe number. HOWEVER: because of the humid storage conditions, the age of this tea (manufactured 14 years ago), and the fact that ink does not stick very well to bamboo wrappers, most of the red ink stamped recipe number has has rubbed off and is un-readable. Despite this, rest assured that the tea is what it is said to be and that it is delicious.